We’d love your help. 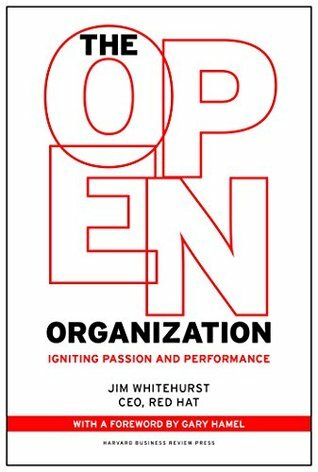 Let us know what’s wrong with this preview of The Open Organization by Jim Whitehurst. To ask other readers questions about The Open Organization, please sign up. If you've been with an organization for a significant duration, the perspective and understanding is often sharply different than what outsiders have. I've been at #RedHat for the greater part of 11 years and as is usually expected, faced the "How is it to work at Red Hat?" question a number of times. The question is simple and perhaps the audience demands a pithy response. The truth is that such an answer is pretty much impossible to craft. How do you begin to explain a company that has as its m If you've been with an organization for a significant duration, the perspective and understanding is often sharply different than what outsiders have. I've been at #RedHat for the greater part of 11 years and as is usually expected, faced the "How is it to work at Red Hat?" question a number of times. The question is simple and perhaps the audience demands a pithy response. The truth is that such an answer is pretty much impossible to craft. How do you begin to explain a company that has as its mission statement the line "To be the catalyst in communities of customers, contributors, and partners creating better technology the open source way." (cf. https://redhat.sc.hodesdigital.com/li...) ? Anyway, the point is, that to an extent, the "What is Red Hat and how is it" side of the question was often answered through innovations in technology, spectacular work in upstream communities and good solid hard work. In some form, the absence of a canon, so to speak, enabled a lot of commentators to write about the company and shape the narrative. While reading through Jim Whitehurst's book (cf. http://www.amazon.com/Open-Organizati...) I realized that this would perhaps be the first step in developing the narrative from the perspective of an insider. And including the points of view of individuals I've seen, known or, met within the company. And that's why it is a great read. Any narrative about Red Hat tends to work around the theme of "enterprise open source company" with typical emphasis on the "open source" parts of how things might work. While this is largely true, the very notion that an agile organization structure can be created drawing upon the fundamental principles is something this book provides a number of citations about. It is not easy work and the surprises which Jim tripped into are well narrated. The part I did like is eschewing the "Red Hat is special" construct of an argument. Instead, it draws upon numerous experiments (successful and failures), conversations, incidents to demonstrate that there are a set of basic guidelines which emerge. A template which can be consciously or, deliberately adopted. The principle that leadership can and will emerge often from the unlikeliest instances and individuals can come together to make a difference is a powerful one. That arc is a strong complement to the values of the company as well as the singular aspect of an open source community - collaboration. The book does well to curate and collate such instances which the (non-RHT) readers can relate well to. But, for the associates (and alumni) there are daily reminders of such events and the fact that this is "just how we get things done". Great book about the COO of Delta, moving to become the CEO of Red Hat. It's a short read, that tells the story of a different type of org. It's like a practical guide on how to deal with open organisations. I didn’t expect to enjoy this book. So many nuggets. For all of the information that I want to reject, I know that those are the exact principles that I need to practice implementing. Looking forward to sharing this one. Jim Whitehurst, as Chief Operating Officer of Delta Airlines, created and fostered a team of employees based upon personal and collective input, collaboration and sacrifice. After taking over the operations helm at Delta, he was faced with keeping the airline afloat and employees/unions secure while fighting off a huge corporate takeover by a competing airline. He did this through a policy of open communication, complete transparency and by treating every single employee like “they mattered” re Jim Whitehurst, as Chief Operating Officer of Delta Airlines, created and fostered a team of employees based upon personal and collective input, collaboration and sacrifice. After taking over the operations helm at Delta, he was faced with keeping the airline afloat and employees/unions secure while fighting off a huge corporate takeover by a competing airline. He did this through a policy of open communication, complete transparency and by treating every single employee like “they mattered” regardless of their title or position. Pay cuts across the board, including his personal salary, an increase in working days and a general tightening of the belt, not only allowed Delta to stave off the competition, but restored profitability to the airline and even restored pay levels, work hours and operating conditions to previous levels. All without layoffs or restructuring. These actions not only saved the airline and garnered the respect of all his employees, but got the attention of RedHat, the world’s leading provider of open source enterprise IT products and services, who, at the time, was looking for a Chief Executive Officer. Whitehurst knew something was different about RedHat, even during the interview process. He arrived in North Carolina, the home of their corporate headquarters, on a Sunday morning to closed offices and no one to meet him. The cab that he would want to return to leaves, and the recruiter pulls up in a car. They proceeded to drive around looking for a place to have coffee. The recruiter didn’t want to talk about his accomplishments, but more about who he was. Afterwards, he met the previous CEO, present at the time, for lunch. After both meetings, he had successfully secured the position and the check at both locations. Interestingly, neither of the individuals he had met with had any cash on hand at the time. This would be the beginning of an entirely new experience for him. Although Whitehurst had built an “Open Organization” during his time at Delta, he did so against the grain and within the confines of a standard corporate structure. At RedHat he would be tasked with continuing their “Open” structure while recreating himself to fit within the ideals of his new home. This began with the Meritocratic structure of RedHat. The book describes this type of organization as, “A system of government or other administration (such as business administration) wherein appointments and responsibilities are objectively assigned to individuals based upon their ‘merits’, namely intelligence, credentials, and education.” In other words, everyone has a chance to be heard, but it’s those that “earn” their place, that get listened to. Throughout the book, he makes the distinction between thermostats and thermometers. Those who set the temperature and those who tell you what the temperature is. If you look at your department and examine the true influence makers within, how many of them carry a title associated with their ability to operate as a thermostat? Furthermore, how many people with the title are truly operating as a thermometer? In a meritocracy, this division of ability and title would never exist. RedHat as a company is driven by passion. Employees within the organization all see themselves as part of the pulse of company and no one questions their worth or value. They just operate within it. The carrot that drives them is not financial gain, albeit with Whitehurst at the helm, RedHat has more than doubled its profits. What drives them is their ability to be the difference that sets themselves apart from other companies, especially tech companies. RedHat employees don’t just come to work, they operate in their purpose. Whitehurst writes that purpose is the primary reason that RedHatters work harder and the company has less turnover than the industry average. This is another book on moving from autocratic leadership to open, inspiring, and communal leadership. It uses the idea of open sourcing. The reason this book separates itself from others is that there is a lot here that can be used to motivate free agency and meritocracy. I'm biased since I work for the company, so a review likely isn't appropriate. Thank you to Jim Whitehurst, CEO of Red Hat, for writing a book about the working environment that calls to my true nature! Within the 200 pages of The Open Organization: Igniting Passion and Performance, he was able to define the seemingly nontraditional and unorthodox management style that I’ve utilized throughout my career. There are no hierarchies, the best ideas win, processes and structure are frowned upon and you are in charge of your own executive buy in. No matter where you fall within Thank you to Jim Whitehurst, CEO of Red Hat, for writing a book about the working environment that calls to my true nature! Within the 200 pages of The Open Organization: Igniting Passion and Performance, he was able to define the seemingly nontraditional and unorthodox management style that I’ve utilized throughout my career. There are no hierarchies, the best ideas win, processes and structure are frowned upon and you are in charge of your own executive buy in. No matter where you fall within the org chart, your advice on the toughest business challenges are solicited and valued. This book will also provide some comforting guidance to my friends who have been having difficulties at startup and (relatively) young IT companies. When navigating new positions, they often describe the environment as chaotic, inefficient or the wild, wild west. Now you have a manual that describes the method to this madness. This is a good read as I believe that more and more organizations will start adopting aspects of this management style because the millenials, Gen Z and beyond entering the workforce are demanding it. If you will be managing or quite frankly, trying to succeed in a corporate environment, then you definitely should read The Open Organization. Very good book, showing the vision where you might want to be with your organization if you do things right as servant leader with self organized fully engaged teams and individuals. A lot of similarity with book "Creativity Inc" where Creativity is about Pixar vs Disney culture differences between two organizations one fully Agile an the other fully corporate, same Open Organization book compares RedHat culture with AirLine corporate culture. worth reading but same like Creativity Inc and few o Very good book, showing the vision where you might want to be with your organization if you do things right as servant leader with self organized fully engaged teams and individuals. A lot of similarity with book "Creativity Inc" where Creativity is about Pixar vs Disney culture differences between two organizations one fully Agile an the other fully corporate, same Open Organization book compares RedHat culture with AirLine corporate culture. This book has cleared my path towards the foundation of my current project to a level I never expected before. The way it deals with team work, management, vision of a company, monetization and personal fulfillment (for the people involved in a project) it's simply brilliant. I appreciate as well the transparency that infuses the author on the way he talks about all the previous topics. He is very honest and that is an aptitude that not many people have and which is very well needed (IMHO). Red Hat has a unique and possibly revolutionary business model, enabled by new forms of technology and organization. If you are looking for a deep dive into how they pull this off you’re unfortunately going to have to write it yourself, or find some good blogs. If on he other hand you want a fluffy feel good piece of drivel about the magical properties of open source software, eat your heart out. A fantastic read. I wish my leadership in all of my precious employers had understood the concepts here, and enabled my team to accomplish everything that we could have. We would have accomplished far more this way than in our limited and constricting environments, and retained the good people longer. Fascinating concepts. A little repetitive but helpful! Great book on the future of organizations. Red Hat has created an open culture that is leading to great innovation and passion in its employees. I’ve joined Red Hat last year but only got the chance to read the book of our CEO now. Happy to see what lays behind the amazing culture that makes me love my job. Open, honest, authentic, passionate, responsive and fast leadership is today’s melody and this can be essential for any company that wishes to thrive, yet still so many companies don’t get it (particularly the larger enterprises) and they wonder why things can often run sub-optimally or degenerate. An “Open Organization” is key, rightly claims the author. This book is his professional story, his passion and his insight all mixed into one powerful, yet comparatively small book. It tells how any co Open, honest, authentic, passionate, responsive and fast leadership is today’s melody and this can be essential for any company that wishes to thrive, yet still so many companies don’t get it (particularly the larger enterprises) and they wonder why things can often run sub-optimally or degenerate. An “Open Organization” is key, rightly claims the author. This book is his professional story, his passion and his insight all mixed into one powerful, yet comparatively small book. It tells how any company can be reenergised, refocused and reinvented by leadership, possibly through “challenging transition”. Technology is not the only disrupting influence; employees and the changing face of employment provides a number of challenges and benefits for good measure too! The book’s publicity blurb warns the prospective reader to get ready to make traditional management thinking obsolete. What is there not to like about that, unless you are stuck in a time warp of course. There is a conundrum, the author notes, as the human capabilities that are most critical to success are those that cannot be “managed” and “demanded”. You might secure an element or perception of compliance by “demanding” initiative, creativity, passion and love from employees with old-fashioned, top-down management control but you will not be getting anything close to what you could get by more “natural” methods. Things may be more relaxed, more effective, more productive and less stressful, even in clearly stressful, active environments. The author notes that a large part of potential success and reward means “…trusting other people to do the right thing - to be hands-off enough to allow the people in the organisation to direct themselves and make their own decisions.” This can become contagious, spreading around the enterprise and leading to increased productivity, greater quality and improved cohesion at all levels. This book is not just for the leaders in an organisation; it can also give a lot of great hints and tips to everybody. Change does not need to come from the top, after all! It is an open, enjoyable and fresh read that is in no way “wagging a finger of disapproval” in the direction of the reader. Certainly it could be one of the more enlightening books you will look at this year unless, of course, you are already doing this sort of stuff. Then, in any case, it is still be a good mental checklist or means to support your course of action. I'll start with the disclaimer that I was a Red Hat employee and Jim, who is Red Hat's CEO distributed the book to those who wanted to read it and I was one of those people. I liked reading the book. The reason for that is the same reason of why I work(ed) at Red Hat: I am an Open Source fan and wanted to see how a company based on Open source works in the real world. I think most people interested in open source will find the book interesting and informative. Maybe no mind blowing things will be I'll start with the disclaimer that I was a Red Hat employee and Jim, who is Red Hat's CEO distributed the book to those who wanted to read it and I was one of those people. I think most people interested in open source will find the book interesting and informative. Maybe no mind blowing things will be unfolded for them (I can't say I found out something unexpected reading it). But it would be fun to read. However this brings me to the first downside of the book and its topic: it has a rather select audience. I would say that the main public will be the open source enthusiasts, even if the target is way broader. The way it's written can be accessible to the average person and I would like that everyone would read the book in order to understand open source companies and dismiss the current view that Microsoft, Oracle and Apple are the representatives of IT... however I am not optimistic that somebody outside the ecosystem will learn of the book's existence. Being in Red Hat was an unique experience and one of the reasons I started reading the book is to see if it presents the reality. And am I glad to say that the contents are very accurate. The book is honest and transparent and I think any Red Hat employee can confirm that. But there is one thing that kind of bothered me: the book focused too much on the positive sides and almost no mention of the down sides. Even if there are a couple of paragraphs that specifically say that an Open Organization is by no means the silver bullet, my over all feel was that it tries sells the idea too much. Which make the book seems more of an ad for Red Hat and Open Source rather than an objective analysis of how Open Source applies to companies. In the book there are many examples of open source principals applied in other companies (even non-IT ones), but still, it's hard to not put Red Hat in center focus. Even if I like to promote Open Source (I do that constantly my self), I would have liked to have seen more impartiality in the book. Book that shows you how to build organization based on merit and not on hierarchy. Will be useful even for those who are in hierarchical organization. It reminded me how important is to spend a lot of time explaining reasoning for your actions, it's never wasted time. Employees want and can understand business if you spend enough time explaining it to bridge information gap between leadership and employees. It also stresses that meritocracy is not democracy. One's influence over decisions is based on his merit is is hardly equal between individuals. I like approach to communication where people are allowed to use mailing lists to communicate openly without management getting involved. Everywhere I've seen such communication it was sooner or later shut down by shortsighted management. Even thou ideas are similar to Creativity, Inc.: Overcoming the Unseen Forces That Stand in the Way of True Inspiration I liked Open Organization much more. Oof. I was so excited when I started this book! Finally, someone was going to eloquently bridge the gap, explaining why open source is not just a way to develop software, but is instead part of an inevitable future societal philosophy championed by the millennial generation. But no. This book is like your dad coming in and talking about Regina Spektor music. He knows he likes it -- it's got a great beat that he can tap his foot to, and he really gets the lyrics -- but it's not his world. It's yo Oof. I was so excited when I started this book! Finally, someone was going to eloquently bridge the gap, explaining why open source is not just a way to develop software, but is instead part of an inevitable future societal philosophy championed by the millennial generation. But no. This book is like your dad coming in and talking about Regina Spektor music. He knows he likes it -- it's got a great beat that he can tap his foot to, and he really gets the lyrics -- but it's not his world. It's your world. And he'll never quite understand it. All was not lost, though. While the book was doggedly repetitive ("See, that's how it works at Red Hat--" I know; you've been making the same point for 100 pages), it does serve to really drive home the foundational elements of a functioning open organization. I suppose it would be worth a read if you happen not to be an active participant in crafting the open culture that defines our generation. This book is written by the CEO of Red Hat - a large public company. - To arrive at the best possible decisions, involve other people in the decision making process and encourage debate. - As a leader it is very important to guy buy-in for your decisions which basically mean people have to be on board with them and understand why they were made. Once again, involving people in the decision making process is a really good way of achieving that. - Its re This book is written by the CEO of Red Hat - a large public company. The book gives an interesting insight into how Red Hat builds engagement, organises work and makes decisions. Given there are not many books unpacking the "open organisation" box, this is an important contribution (it merits an extra star just for that). However, I was hoping for some more insight into specific mechanisms and practices. While Whitehurst includes a rich set of anecdotes, the "key takeaways" at the end of each chapter sound superficial and the book occasionally looks repetitive. Th The book gives an interesting insight into how Red Hat builds engagement, organises work and makes decisions. Given there are not many books unpacking the "open organisation" box, this is an important contribution (it merits an extra star just for that). However, I was hoping for some more insight into specific mechanisms and practices. While Whitehurst includes a rich set of anecdotes, the "key takeaways" at the end of each chapter sound superficial and the book occasionally looks repetitive. Un nuevo modelo de organización (no tan nuevo) pero aplicado casi desde su formación en Red Hat. Desde la creación de sus productos hasta su management y su reto de expandir la misma cultura alrededor del mundo. Como bien lo resume el libro al final, esta no es la historia de como un CEO super héroe conquisto y posicionó su compañía, sino como una comunidad lo esta haciendo con sostenibilidad y saliendo de crisis como la de 2001, que por poco y la desaparece. If you are a leader or manager and want to find a better way to lead - this is the book for you. It's not about democracy - rather about a system of meritocracy and natural leadership. I found this truly inspiring. There were a lot of interesting stories in this group, but the basics weren't earth-shattering. I was hoping for more of an under-the-hood look at how a company can work with both a paid workforce (Red Hat employees) and a volunteer workforce (open source developers).